Diagnosing sleep apnea by going to a sleep study is one of the best decisions you can make in order to have a healthier sleep. The laboratory diagnosis is correct most of the times, with plenty of additional information that can help your treatment for sleep apnea. But what if you are in a situation where you can’t afford to have a sleep study, or you are not helped by an insurance company? Well, you have a chance to diagnose sleep apnea at home by you, or with a little help from your spouse. These tips to diagnose sleep apnea in a cheap way are not as effective as a sleep study, but it can help you understand what happens with you during sleep and motivate you to take the decision to see a doctor. Being single makes the sleep apnea diagnosis more difficult, because nobody is watching your sleep. Watching an apnea event in the middle of the night can be a terrifying experience for your spouse, so she/he can give you the first warnings. But when you live alone, you have no idea what happens during your sleep. So you have to figure it out by yourself. If you have sleep apnea, not enough air enter into your lungs during sleep. The amount of oxygen in your blood decreases. With low blood oxygen level, your brain is affected. The brain will release stress hormones that will raise you blood pressure, risk of heart attack, stroke and irregular heart rhythm. For more info about headaches from sleep apnea, see Sleep Apnea Headaches. There is a powerful link between sleep apnea and heart problems. If you don’t treat sleep apnea in time, your heart health will be one of the targets. This heart problem can be prevented if sleep apnea is treated correctly. To learn how can sleep apnea affects your heart, see Congestive Heart Failure. 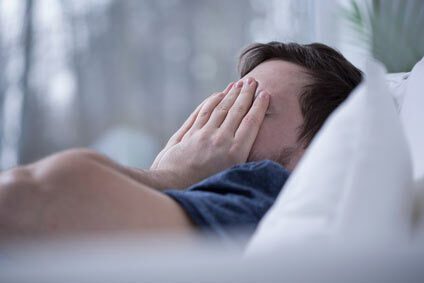 The daytime sleepiness is common to people with sleep apnea. Did you notice that you often fall asleep during the day? “Maybe I am getting old…” you’ll think. But it’s not normal to sleep at weddings, at sport events, at work, or at wheel while driving. This symptom is very important in diagnosing sleep apnea, and there are some tests that can help you discover how much sleepy are you during the day. The excessive daytime sleepiness may lead to problems at work, problems with the family, and problems dealing with friends. It often causes irritability, decreased productivity or injuries on the job, motor vehicle accidents, and disruptive family and social relationship. For more info about driving a car while suffering from sleep apnea, see Drowsy Driving. You don’t need a bed partner to tell you that you are overweight. You can see yourself in the mirror. Obesity is very common among people with sleep apnea. But not everyone who has sleep apnea is necessarily overweight. A thick neck with a lot of fat can obstruct your airway. For example, men and women with large neck size: 17 inches or more for men, 16 inches or more for women, are in danger to manifest sleep apnea symptoms. For more info about obesity in people with sleep apnea, see Sleep Apnea and Obesity. Pickwickian Syndrome is a type of sleep apnea associated with extreme obesity. This syndrome was mentioned for the first time during during the time of Alexander the Great. This disorder can be improved with a personalized diet and weight loss program, but sometimes surgery is necessary. To learn how to deal with extreme obesity, see Pickwickian Syndrome. Do You Want to Test OSA at Home? Are you interested in diagnosing sleep apnea at home, with a simple and cheap method? The article about home testing can get you very close to diagnose sleep apnea. Bed partners are crucial informants in diagnosing sleep apnea. Your bed partner can save your life. If you don’t have a partner, then buy one! If you are single and living alone, diagnosing sleep apnea can be difficult. Do you know if you snore during sleep? I am sure you don’t. You need someone to tell you that. “Someone” is maybe your bed partner. Regardless of the situation, you must find out if you have a sleep disorder. Untreated, sleep apnea can evolve in time, worsening over the course of many years, until it presents a real threat to life. Your bed partner can be your best friend in diagnosing sleep apnea. A detailed history from bed partners is imperative in all cases of suspected or undiagnosed sleep apnea. Snoring is the cardinal complaint reported by the bed partner. Typically, the snoring is loud, nightly, and has existed for many years. Snoring may be so disruptive that partners may be driven to sleep in another room. A bed partner may report a witnessed apnea that is often followed by loud snorts or gasps at the end of apneic episodes. This can be extremely concerning to the partner and serve as the trigger to seek medical attention. If your partner has irregular snoring, with breathing that stops briefly, with struggle to breathe…then you must be careful. This is a common symptoms of sleep apnea. Apnea snoring is noisy and powerful. You may suspect sleep apnea if these symptoms are present, but diagnosing sleep apnea must be confirmed with an apnea monitor or sleep monitor. This monitor will reveal pauses in breathing, sleep arousals and low blood oxygen level. For more info about snoring, see Sleep Apnea Snoring. A patient with sleep apnea syndrome might not even be aware that he woke up 500 to 1000 times during the night! But YOU will know! A normal person has irregular breathing at certain times during sleep. But a person with sleep apnea stops breathing entirely and may hold his breath for at least 10 seconds. And it may happen more than 5 times during a sleep to a couple of hundreds! The most strange thing is that your partner is not aware of such effort of breathing. 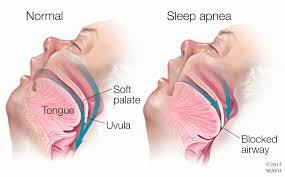 For more info about apnea episodes, see Stop Breathing While Sleeping.